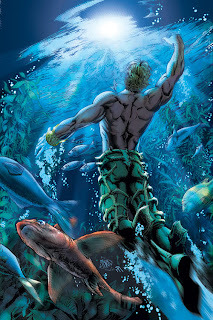 ﻿Aquaman is the King of the Seven Seas and ruler of Atlantis. He is one of the founders of the Justice League of America and one of DC Comic's most recognized heroes. Young Arthur with his parents (Tom and Atlanna)According to his first origin story, Aquaman a.k.a. 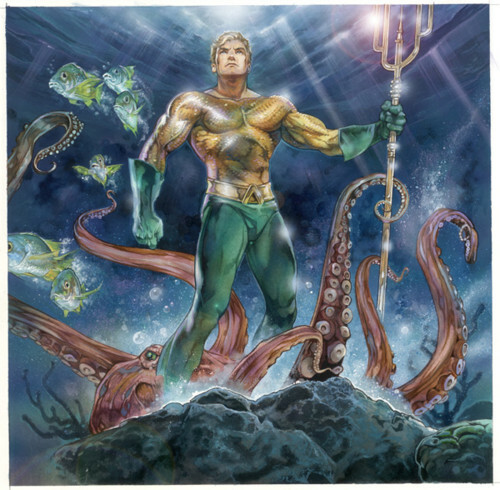 Arthur Curry was the son of Atlanna, an Atlantean princess banished from Atlantis due to her interest in and frequent visits to the surface world; and Tom Curry, a surface man and lighthouse keeper. One night, amidst a terrible storm, Tom Curry would find Atlanna thrown up on the shore by storm-tossed waves, and rescue her from harm. Both Curry and Atlanna made the lighthouse their home and developed a strong bond that would quickly lead to a sentimental relationship, which in turn, would later lead to the birth of Arthur Curry. Tom Curry accepted his relationship with Atlanna, and though he always knew there was more to her than she would let on, he'd never ask her about her origins. After Arthur was born, all of that became even more irrelevant as his presence there cemented the bond between the two. Young Arthur was found by his father playing underwater two years after his birth after he had apparently been there for an hour without drowning. Several years later, both Tom and Arthur himself would learn the truth about Atlanna's origins, as she would reveal that she came from the lost continent of Atlantis while she lay in her deathbed. Atlanna would also reveal to Arthur that he had inherited her ability to live and breathe underwater, as well as her power to communicate with and control all marine life. After Atlanna's death, Arthur's father became determined to train him both physically and mentally so that he would one day be in complete control of his powers. Arthur was also taught by his father to view himself as someone special, as a savior of the oceans, as The King of the Seven Seas. Aquaman, Later, after his father's death, Arthur Curry would leave the lighthouse which had been a home to him and his family for years, to venture into the oceans and find his true destiny. He would later become the king of Atlantis and marry Mera, a visitor from an other-dimensional water-world known as Xebel. He would also take young Aqualad under his wing and fight the forces of evil side by side with the occasional help of his wife, Mera.